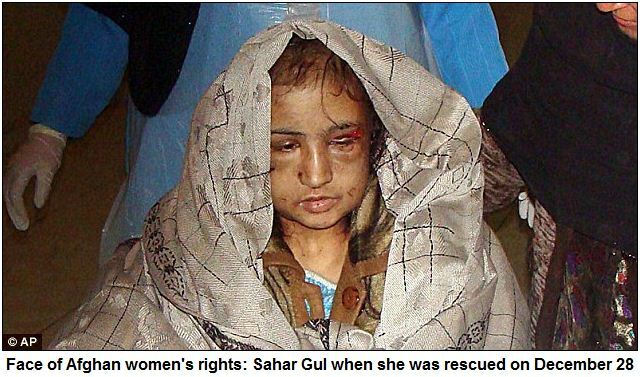 THE FACE OF HUMAN RIGHTS IN AFGHANISTAN……. – The Tundra Tabloids……. THE FACE OF HUMAN RIGHTS IN AFGHANISTAN……. NOTE: Click the Guardian link for a fuller story and pictures of the hapless lass. Sahar Gul became the bruised and bloodied face of women’s rights in Afghanistan after she was rescued in late December when an uncle called police. Speaking in an interview on Saturday from a hospital in Kabul, Gul blamed her husband, his parents and his sister for her ordeal. Previous Post Previous Post NORWEGIAN POLICE SURPRISED THAT 9 OUT OF 10 RAPES IN STAVANGER COMMITTED BY FOREIGNERS……. Next Post Next Post RON PAUL EAGERLY SHAKES HANDS WITH THE VEHEMENTLY ANTI-ISRAEL NETUREI KARTA…….